IS THE HOTTEST TICKET IN TOWN !! If you've not yet seen a Kidd Madonny show, then get yourself here to witness a musical prowess and on-stage showmanship which are nothing short of a nightclub legend. The fast-rising star is being clocked and selected by the world's most elite talent buyers, securing a new weekly residency in Miami, a string of three monthly residencies in Los Angeles, Las Vegas and San Diego, plus quarterly residencies in Boston, Washington DC and Tampa, with other major markets calling him for one-offs and special events. IN THE INDUSTRY, HE'S THE "GO-TO-GUY"
Kidd became famous for raising the bar. A Kidd Madonny performance is going to set the standard for producing an exciting high-profile event. Is it any wonder? With his couture costumes sporting laser-adorned headpieces and shiny illuminated disco armor, it couldn't be any more obvious how he labors over the details to create unique elements stacked up to craft a once-in-a-lifetime nightclub experience. 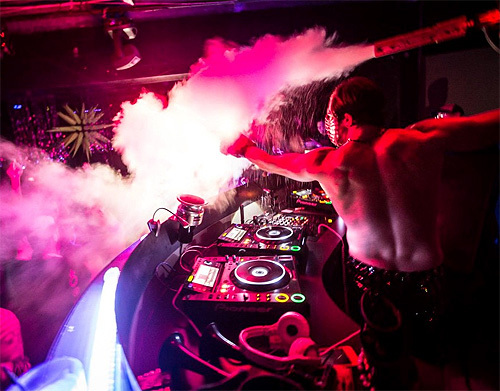 In a world where DJs peer into their laptops intent on creating a sustainable groove, this Miami / Ft. Lauderdale based DJ delivers an absolutely over-the-top South Beach style party to every city and event. Throughout his career, he has sought to break the self-imposed constraints of current club culture, always pushing for amazing new experiences in sight and sound. Each show is a unique stand alone production. It's a custom designed interactive light show and dance performance choreographed from beginning to end. This is an audiovisual experience of the highest level. City by city, each night he leaves the audience with a memory they'll not soon forget. He transforms the venue visually then drops tunes beginning on the funkier end of the spectrum bringing the energy level to its peak hour, when timeless anthems mix with the latest sounds captivating clubland. "Thank you! I have so much more love and music for you all. I can't wait to bring it. See you down front and on the dance floor." The Bourbon Pub / Parade beginning at 9p.m. JESSIE COLTER and RIKK YORK.